Moreb Hill, one of the world's highest sand dunes, nearly one thousand feet high, resides at the end of a twelve-and-a-half mile road with no other destination. 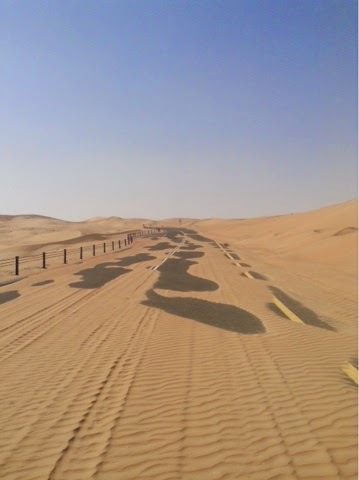 The road is a spur off the main highway through the Liwa Oasis. It dead ends within twenty miles of Saudi Arabia. 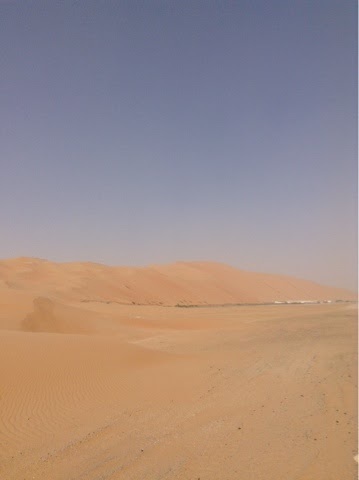 This is where the Empty Quarter begins. It was the first road I'd been on over here that didn't have camel high fences or vegetation projects keeping it company. At last, I truly was penetrating the desert. The blowing sand and no traffic made it feel all the more so. The dunes were so high and so majestic all around me, I wondered if this dune was truly so exceptional as to warrant my present battle with the winds and the hills to go all the way out to the end of the road, only to have to turn around and repeat the battle. The wind was mostly from the side, so the return would be no easier than the ride out. I couldn't imagine that Moreb could be any more breathtaking than anything else I had seen. I wasn't really sure if I wanted to go out of my way at the expense of all the energy I was expending to see some "tourist sight," rather than sticking to my usual style of just enjoying the sights on my way to wherever I was going. That was too much like being a tourist, rather than a traveler. 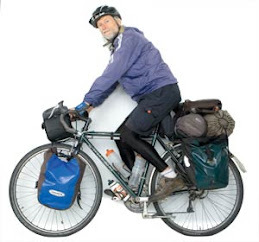 As my conscience debated the issue as I pushed up one steep, wind-blasted climb after another in my lowest gear, the scenery ahead kept drawing me further and further down the road. I knew this was a ride without compare to the edge of civilization. I could hardly take advantage of the descents, as I feared hitting a patch of sand around a bend, not being able to brake in time to avoid it. The sand was gathering at the road's edge. Soon I was halfway there and then within a couple of miles. I had no worries about food or water, as I was fully-provisioned, and the half-day I was sacrificing for this wouldn't put me under pressure to get back to Dubai in time for my flight home over a week away, so I couldn't use logistical considerations as justifications for turning around. After nearly two hours I reached road's end. It was in a horseshoe of three large dunes. I didn't know which was Moreb. I was right that Moreb wasn't any more spectacular than countless other dunes I'd passed, just somewhat higher. A cluster of buildings at the base of one implied that it was Moreb, as did the three lines of rope two-thirds of the way to its summit for sight-seers to pull themselves up with. The amenities came as a surprise, especially since no one else was making the trip out this way even though it was Friday, the first day of the Islamic weekend. The huge parking lot at the base of Moreb was empty. The whole place seemed deserted. I was happy to discover the men's room was unlocked and that an electrical outlet outside of it was on. I could do some wash and some charging. After several minutes someone peeked into the washroom and pleasantly asked, "Where are you from?" I could recognize him as a guest worker, probably Indian. I told him I was from the US and didn't realize anyone else was out here. He asked, "Is that your iPad out there?" "It is. There wouldn't by chance be WIFI here?" I replied. "There is. Come around to my room when you're done and you can use it?" This was too good to be true. It had been three days since I'd last come across WIFI. To find it at this distant outpost was well nigh a miracle. He was part of a crew of half a dozen workers who looked after the complex out here. The month before was a huge annual week-long car, motor cycle, horse, falcon and camel racing festival on the surrounding flats. It attracted thousands from all over. And throughout the cooler months people came out to climb Moreb, though not today. He shared a room with his brother. They weren't Indian, but rather Afghanis. 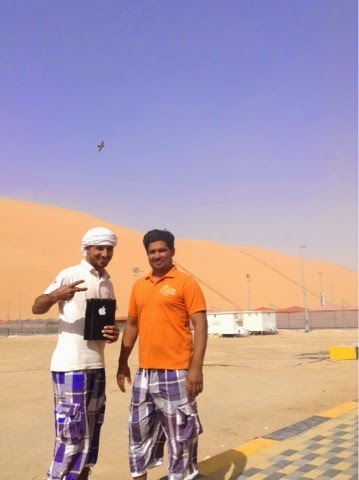 Their English was perfect and they both had iPads to stay in touch with their families back home. They were here on their third one-year contract, returning home for a month after each year. They grabbed a chair from another room for me to sit on, but I told them I preferred the floor, as did they. They put out a bowl of dates and offered tea or coffee. After chatting for a while and sharing photos on our iPads they let me at my computer and they returned to theirs, as they largely spent their free time. When the call to prayer sounded, they both left the room. When they returned, they brought me a plate of rice with a chicken drum stick, my usual lunch at the local trucker cafes. They felt fortunate to have the opportunity to work here, though of course their separation from their wives and children wasn't so easy. 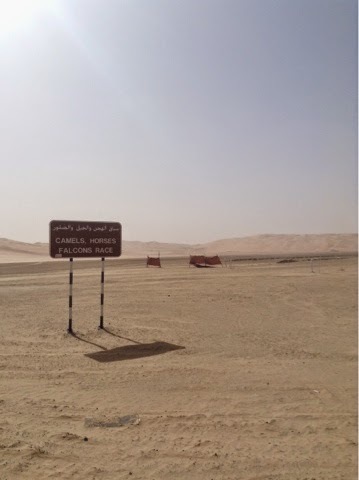 It was hard to say was more boggled, they having an American sitting in their room, or me sitting in the living quarters of a couple of Afghanis at the base of one of the highest sand dunes in the world just a few miles from Saudi Arabia. Such is the marvel of travel. Moreb may not have been anything special, but this experience more than vindicated the ride out to it. They used Apple's FaceTime to communicate with friends and family in Afghanistan and asked to add me to their directory. I will be delighted to hear from them when I return home. They invited me to spend the night, but with the wind blowing sand over the road as I came in, I wished to be on my way lest the road truly get buried. And it was well that I did, because during my two hours out there the road had begun to disappear. I also came upon a cluster of nursing camels being shepherded back to their encampment. The shepherd offered me a can of Mountain Dew, my second soda of the day. The Afghanis sent me off with a can of coke. Never have I enjoyed such hospitality. So it has been since my arrival, from one and all--locals, ex-pats and guest workers. Everyone looks after everyone else here. 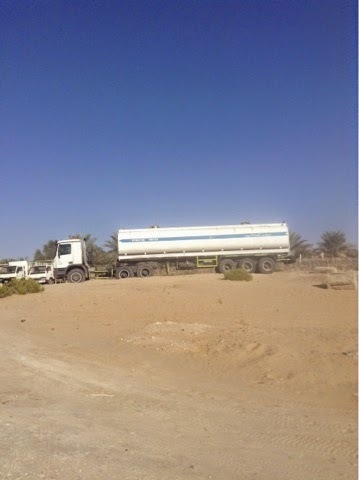 The environment is harsh and water so scarce it is brought out in huge trucks. Photos show car tracks on the slope of the hill. Is the surface firm enough to drive up or only down? If up then the sand must be cemented with gypsum or lime causing the dune to be relatively stable. 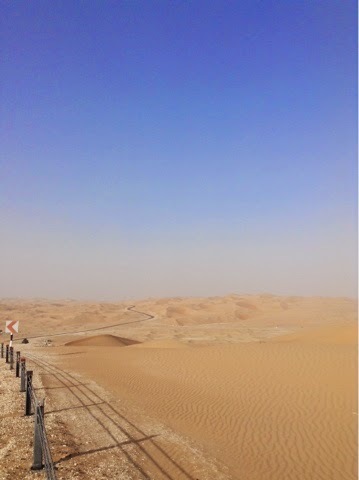 Dune stability might explain the willingness to build close to the dune and the longevity of Liwa oases? Dud: The sand is soft. One sinks to their ankles. I have seen dune buggies flying through such conditions.